1) The Lucas Plan was proof of workers’ potential to run production themselves, with the wider social and environmental good in mind. 2) The Lucas Plan was also proof of the division and hierarchy within the working class: the engineers focused their proposals more on the policy makers than on their fellow manual workers within and beyond Lucas – a tradition as old as the official labour movement, such as the Second International. 3) While a lot of energy was focused on trying to convince government and management of the Plan, the actual resistance against redundancies, e.g. in terms of occupations or blockades, was neglected. 4) At a time of wider unrest and wildcat actions amongst manual workers throughout the UK – many of them women and migrants – and the looming Winter of Discontent, the Lucas workers’ dispute had a fair chance to overcome its isolation. 5) ’Self-management’ isolated from class struggle tends to put the burden of crisis onto workers’ shoulders: after factory occupations such as Zanon during the crisis in Argentina in the early 2000s, the social-democratic government under Kirchner established a ‘cooperative plan’ that allowed workers to run bankrupt companies themselves and reserved the right of the owner to claim the factory back once they thought it to be profitable. 6) From Chile in 1973 to Greece in 2015: the left wing government relies on the social power of the working class but ends up manipulating workers’ interest in taking control of the production process. This is because they inevitably have to compromise with international capital and their own interest in maintaining state power. This ends in disillusion and defeat – and comrades who promote parliamentary politics share some of the responsibility for it. 7) Reconsidering the Lucas Plan gives us a chance to clarify ideas regarding automation. It is peculiar that at a time of historically low levels of productive investment the (voluntary or involuntary) spokespeople of capital proclaim that automation will do away with workers anywhere, anytime soon. 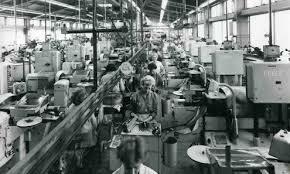 To counteract this propaganda we propose direct workers’ inquiry and empirical research into current technological developments and their application on the shopfloor. 8) It is true, machinery is not neutral and it is a means of capital to discipline and control workers. But it is a contradictory means in two senses: a) with the increase of structural unemployment wages decrease and we see a return of labour intensive production and low investment in machinery; capital becomes a barrier to labour-saving technologies; b) machinery is not a product of capital, but of a hierarchical division of labour, engaging workers with their own interest and subjectivities; machines are not applied by capital, but again, by workers who have to fine-tune their usage and in this process find ways to undermine its control function. We have to analyse and emphasise the contradictions within the production and application of technology. The collusion of the intellectual workers has to be questioned from below: from the multi-skilled wider section of the working class.